additionnal services and expertise ! 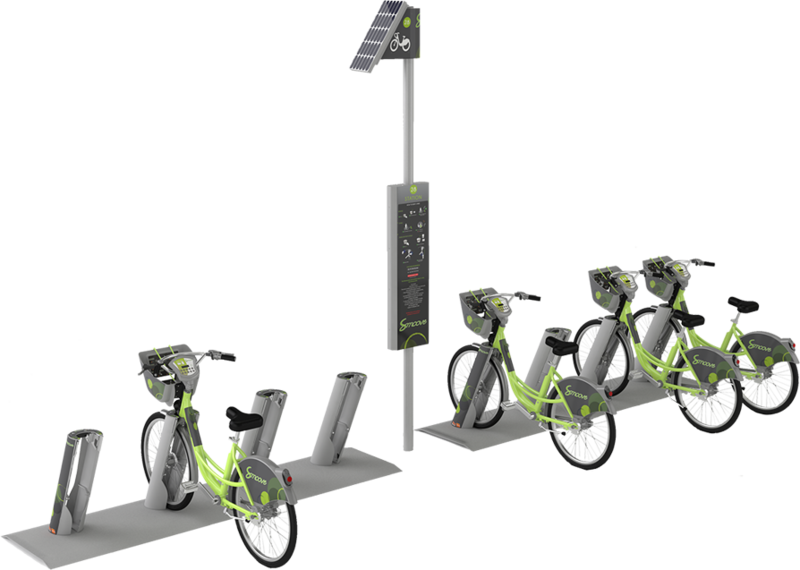 Material solutions : wich include intelligent bikes equipped with a « Smoove Box », wireless passive bike docking posts, subscription and informations kiosks, most of wich are solar powered, designed for a simple installation with the minimum of civil engineering work. All equipment is highly robust, vandal-resistant and with low maintenance needs. Software solutions : to manage the bikes, the cards reader, the rentals, payment solutions and their integration into third party information systems typically linked to public transport. 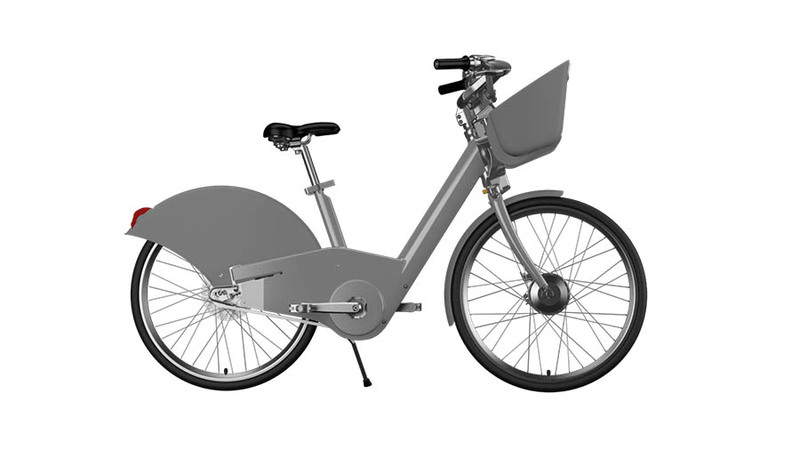 A range of additional products to the bike-share system including the management of long term bike hire systems and ways of securing the bike parking ( mono bike or collective shelters). Specialised expertise ranging from upstream studies on bike services, to assistance and training on the implementation of our solution as well as ongoing operational and maintenance support. 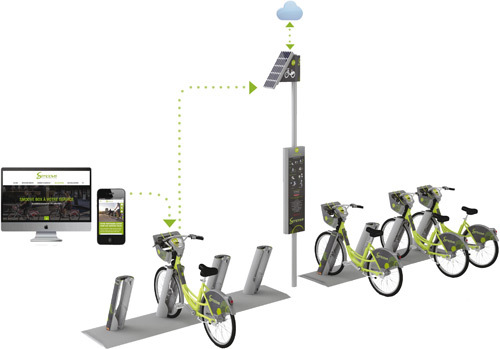 Bike-share systems have revolutionized the image and usage of city bikes. These bikes a however exposed to difficult usage conditions, left unattended and requiring a specific design. 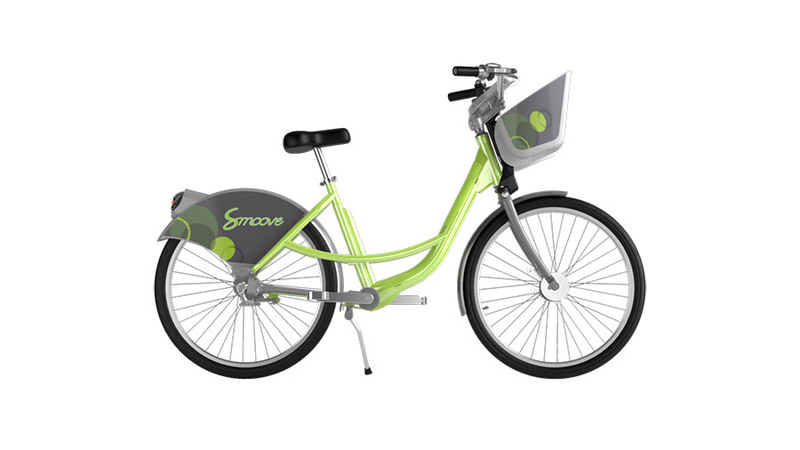 In order to give our clients the best choise, Smoove have designed several very good urban bike models, specifically for bike-share systems, all integrating the Smoove box system.Bike-share systems have revolutionized the image and usage of city bikes. These bikes a however exposed to difficult usage conditions, left unattended and requiring a specific design. 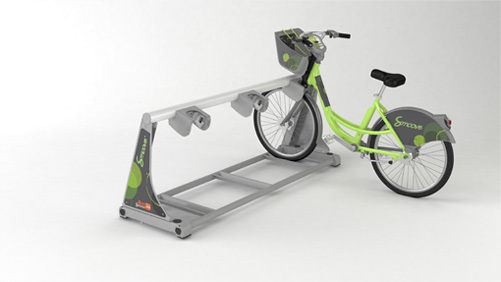 In order to give our clients the best choise, Smoove have designed several very good urban bike models, specifically for bike-share systems, all integrating the Smoove box system. quick and direct acces to a very secure and autonomus bike. An electronic control box, conveniently located on the handlebar, continously charged through a hub dynamo and therefor self-powered wich allows quick and direct acces to the bike without keys or totems. Advantages of the "smoove box"
With a limited civil engineering work, no wiring or electricity required, our stations are very flexible in their integration within public areas. 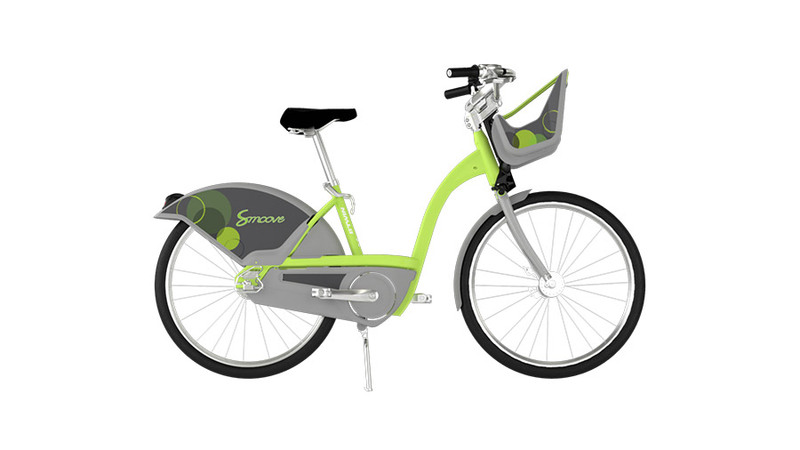 In addition to the bikes, the Smoove box system also includes specific parking equipment that constitutes the « female » end of the fork lock thus ensuring its utmost security. The Smoove experience has proved it, no bike returned to its stand (docking post) can be stolen, a fundamental difference between Smoove and many other rival solutions! 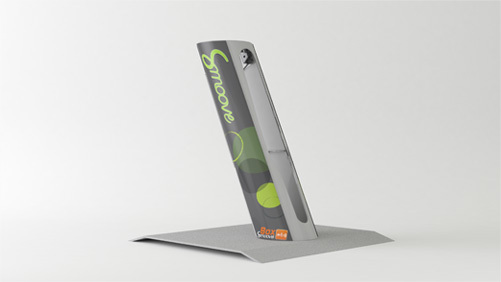 Smoove has designed a range of equipment that can be configured to any context, design preference or budgets. The docking system is « passive » and does not require electric power. It simply needs an RFID tag to identify each parking stand; it is cheaper than our competitors' parking equipment which require wiring. 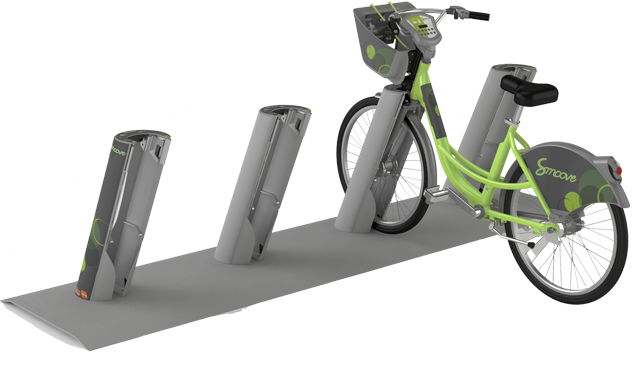 The bike-share stands can be placed in greater numbers thereby minimizing the inconvenience of full stations. The components are delivered on a pallet, pre-assembled, handled manually, fixed to each other and to the ground by simple dowelling. Their installation is quick, easy, cable free and doesn’t require heavy civil engineering work. They can be moved easily during the life of the project. 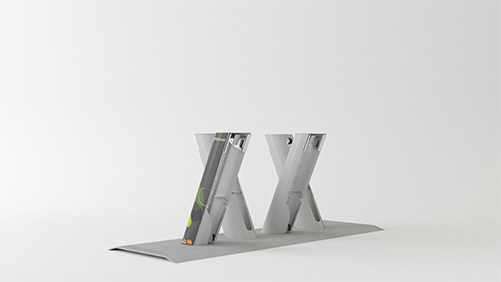 The Smoove bike stands can be separated from each other, even positioned on opposite sides of a square or a street, facilitating the station integration within any urban space. 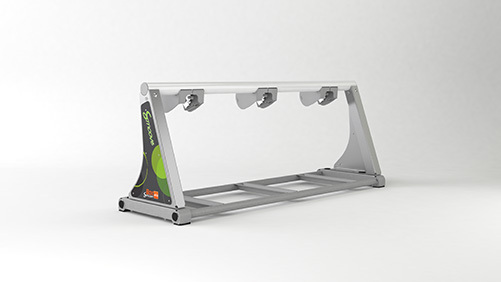 The « well designed bike stands », are individual docking posts into which the front wheel of the bike is inserted. They are either fixed onto mobile metallic platforms or onto more permanent rails buried underground; they can be positioned in single or double configuration for greater density. 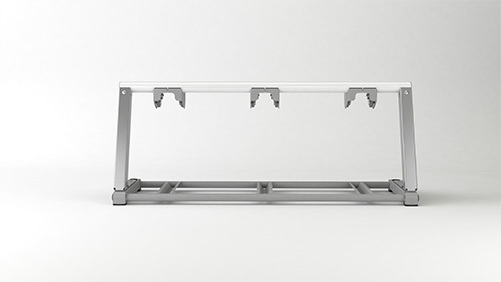 The horizontal rails are equipped with 3 docking points in the shape of a unique and simple cost effective free standing structure. From the simple function of autonomous solar radio relay without « Human-Machine Interface » (HMI), to the most sophisticated solutions with a large tactile screen and credit card swipe payment solution. The users of the early generations of bike-share systems had to use a kiosk (also called « totem »), before being able to take a bike, a complex and costly element of the bike-share system. 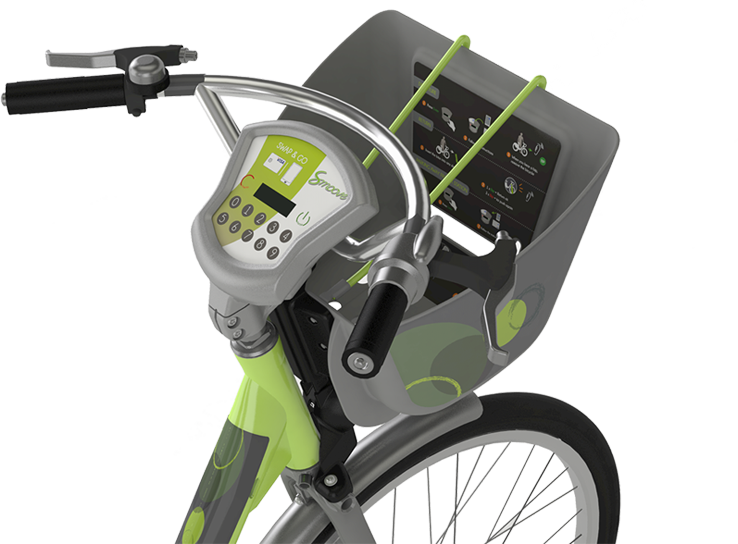 The Smoove system only required the presence of a small cable free self-powered solar relay box, which communicates to the bike via Zigbee radio and to the central server via GPRS. Smoove has also developed other types of virtual subscription options either using an « interactive vocal server » (IVS) with a standard phone, a smartphone or the internet. The « traditional » totem with information screen and credit card payment is only one of the ways to access the system. It is possibly a solution more suited to popular tourist sites with high visitor numbers. 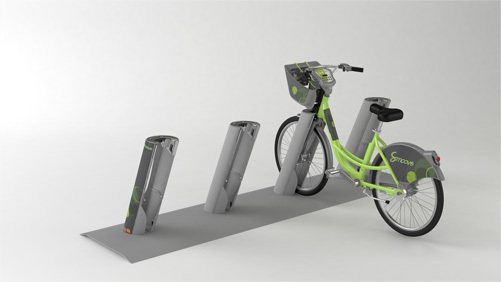 Smoove has also wanted to avoid the necessity of a kiosk dedicated only to the bike-share service by developing multi-modal solutions of a kiosk shared with the ticketing of an urban transport network or with pay and display ticket machines already in place. Smoove has developed their own payment kiosk but has also naturally integrated third party kiosk solutions according to the specific needs of different cities and towns. - The global solution or a simple middleware integrated to a third party information system. - A solution hosted by us with a maintenance contract or a solution transferred to the client server.